Well, there was no question about it. 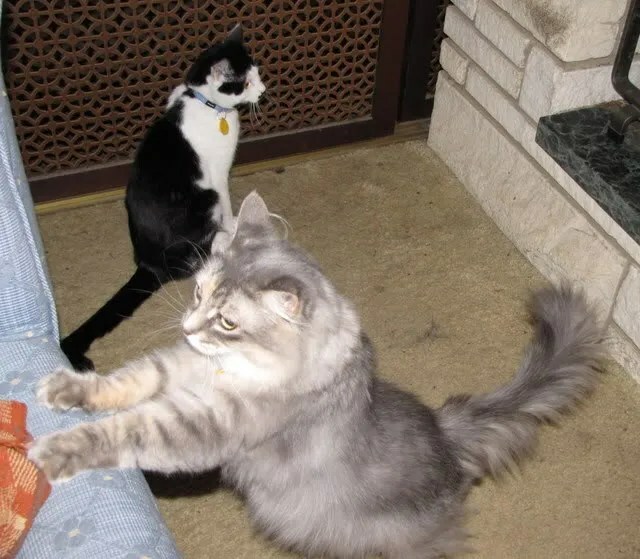 Keola wasn’t going to hiss or growl at Noelani, and she wasn’t going to do the same thing to him. There was no raised fur, only friendliness. I was in awe. 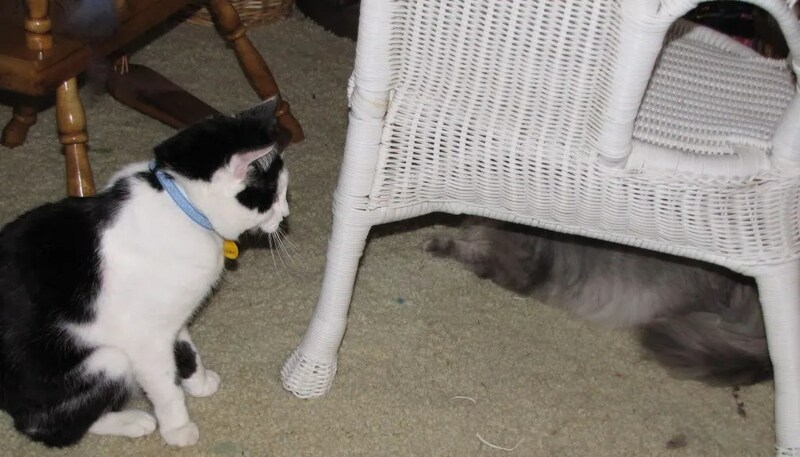 The two of them got acquainted a bit more, and then, oh no!! They heard a noise! 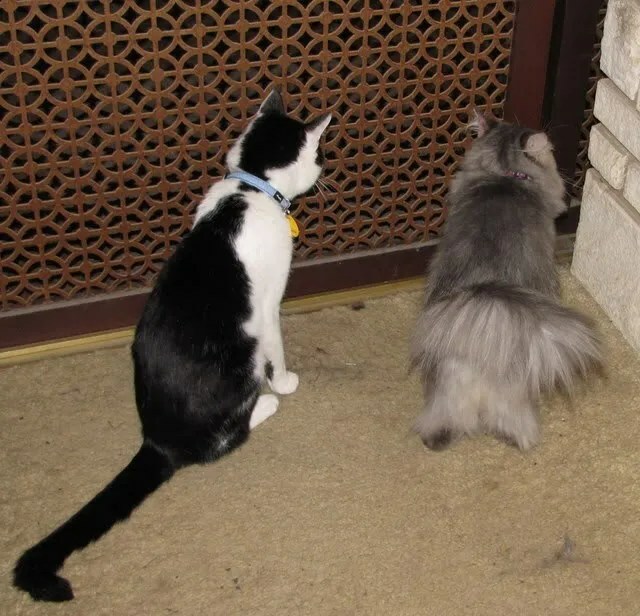 They both went to the closed living room doors (we’d closed the doors to keep them confined in case wild fighting broke out and we had to corral them) to investigate. Oh no! It was a strange dog!! Kukui was just outside the doors! Keola was far more concerned than Noelani was. Maybe he was protecting her from this huge (to him) furry doggie just outside the door? Well, Kukui wandered away, and Noelani decided she’d rather use the couch as a scratching post. She got scolded. 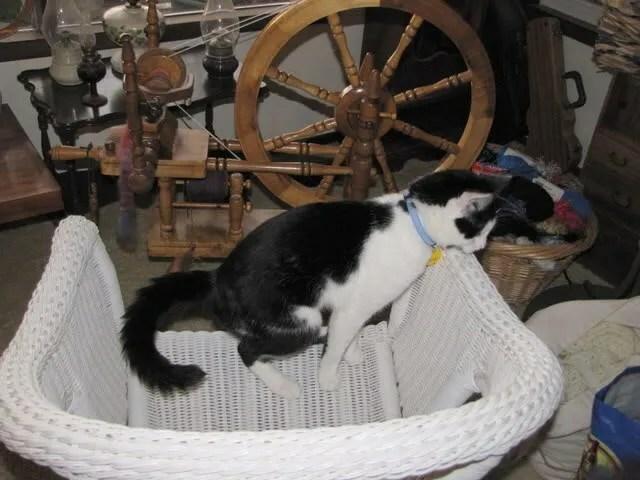 Then Noelani decided she wanted to explore things under my spinning chair. Keola couldn’t figure out where she’d gone. He looked a bit perplexed. Why would she want to hide from him? 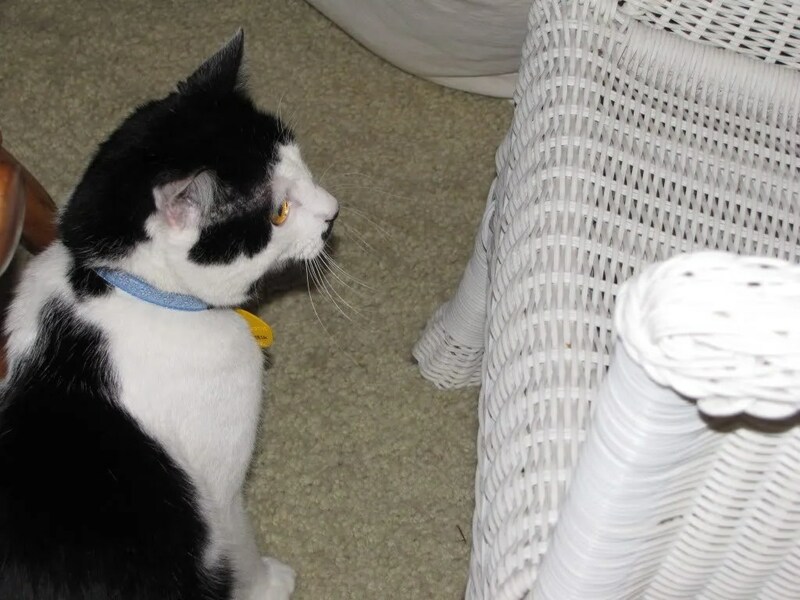 He hopped back up onto the chair and peered down, trying to see her better. 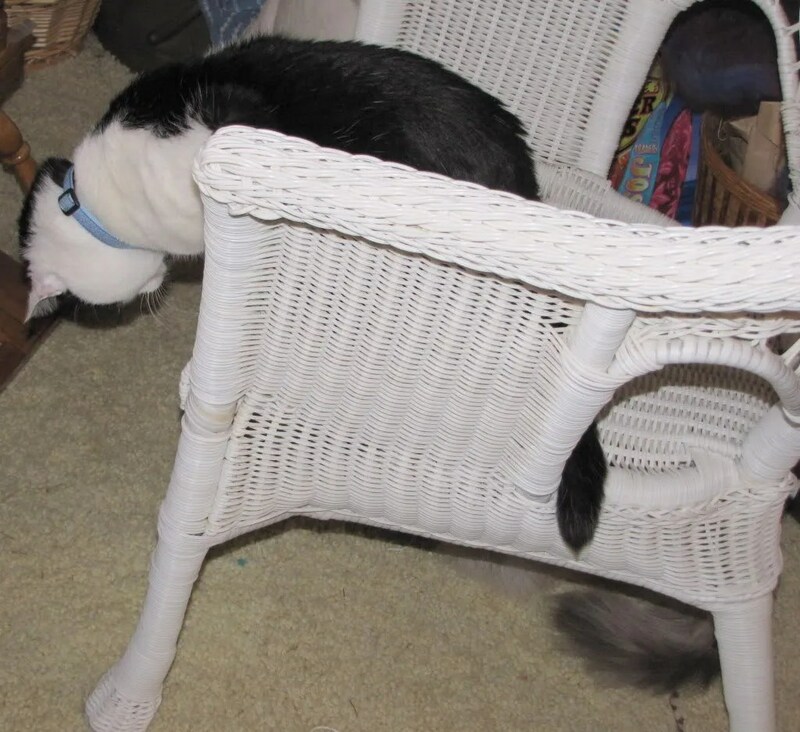 He looked through the puka in the chair. It was so cute to watch him. Maybe he was scared he was going to lose his new buddy! By the time it was bedtime, it was clear they were going to be good friends. They’d hung out all evening, and there hadn’t been a cross word between them at all. So we opened the living room doors, keeping Kukui away for the time being. They’d had enough excitement and newness already. By the next day, it was obvious that they were going to be best friends. 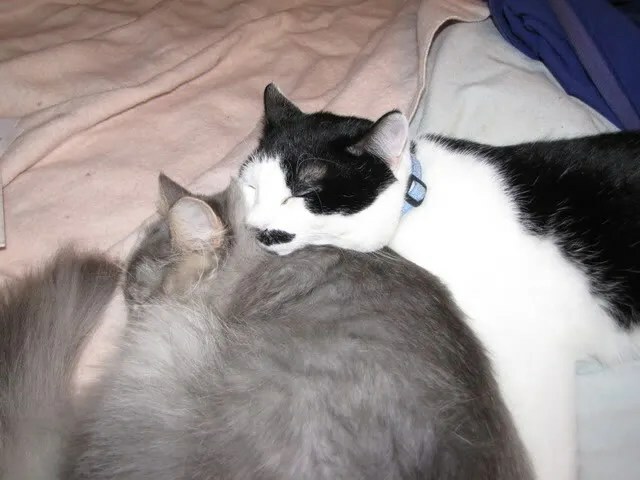 They’d come from the same shelter, but had never seen each other before, and now, here they were, so attached to each other that you’d think they’d been littermates. But in less than twenty-four hours, they were incredibly bonded. The pain of losing ʻUkulele was still with me, but I kinda felt like she had sent these two new kitties to me to help ease that pain. It was like she knew somehow, that these were the ones who she wanted me to have. Two new best friends. The house didn’t seem so empty anymore. lol, I guess four would be even better than. How cute and loving they are together! My Buddha is very sick. We will be making the hardest decision before too much longer. Yesterday she was still playing and today she is still eating, so not right away. I am savoring the time. 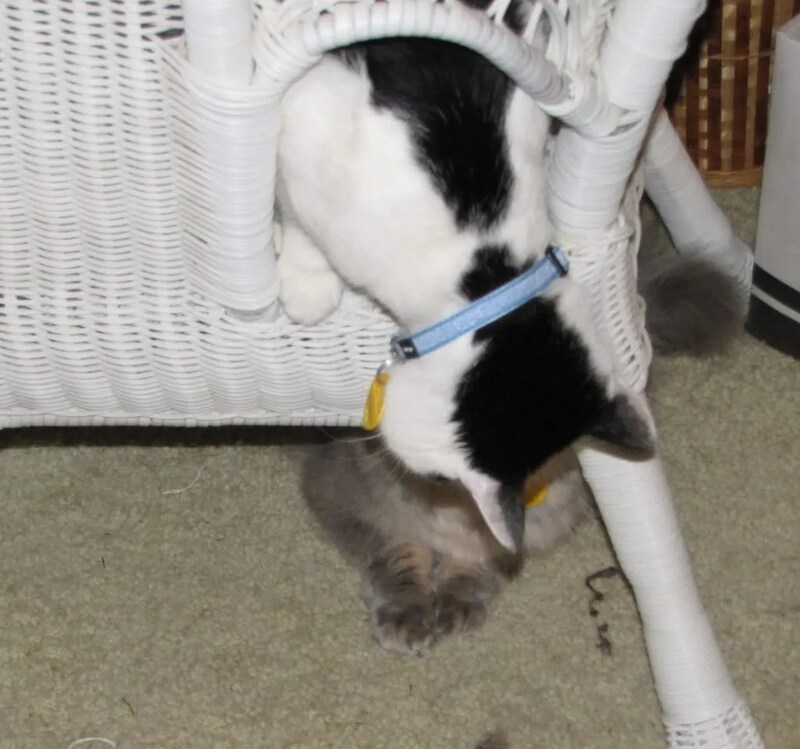 I am amazed and touched by how wonderfully and quickly your kitties bonded. 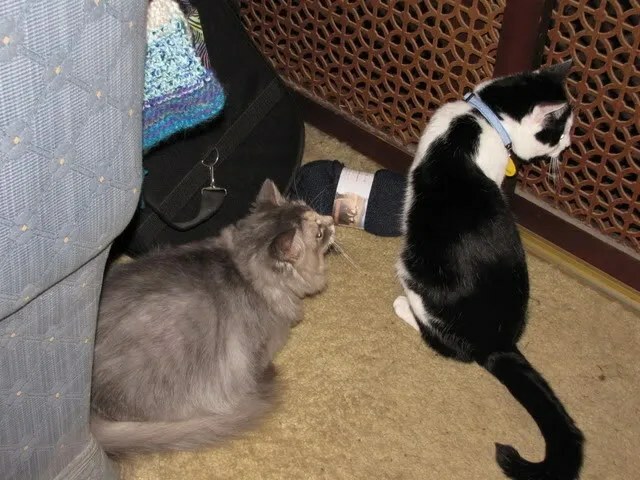 My three kitties and pooch tolerate one another, but they don’t seem to crave one anothers’ company.